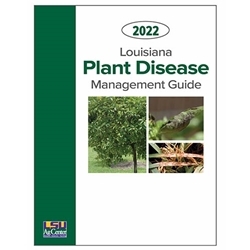 This 2019 guide contains suggestions for management of the most important or more prevalent diseases of Louisiana plants. It includes information on fungicides, bactericides and nematicides, as well as safety precautions for using them. The guide has instructions for sending specimens to the LSU AgCenter’s Plant Disease Diagnostic Clinic and includes detailed recommendations for disease management for field crops, fruit crops, turfgrasses, ornamentals, Christmas trees and vegetables. Nematode management information also is included.